Microsoft today announced the Games for Windows Marketplace, a new online PC games store for online distribution, that will launch on November 15th. The store will offers gamers easy online access from anywhere, search by titles, genres and publisher, discounted games, Deal of The Week and other recurring and seasonal offers. The Games for Windows Marketplace will make gamers life easier, allowing them just with “fewer clicks to purchase and download” the desired game and then play it. 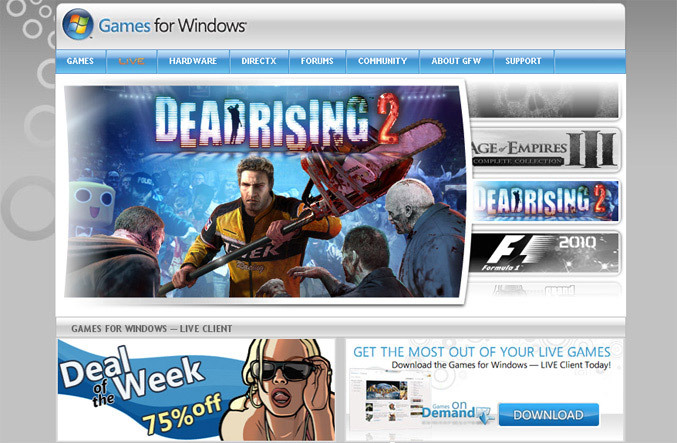 The web store has integrated Xbox LIVE and Windows Live services, also supports Microsoft Points (as well as credit card purchasing) and will launch with over 100 titles from Microsoft Game Studios, Rockstar, Capcom Entertainment Inc., 2K Games, Warner Brothers, Square Enix Co. Ltd. and more.